The Mazda6 - or Mazda 6 - has been a favorite in the midsize sedan category since its inception. This current-generation of the 6 features graceful style, an award-winning interior and athletic appeal. There's really nothing to dislike about the 2017 Mazda MAZDA6. The 2017 model year marks the end of the 6's current generation, with 2018 bringing an all-new Mazda6 to replace it. This has advantages for the new car buyer, which makes the 2017 Mazda6 even more appealing than it already is. For the 2017, there's some shuffling of features, including the addition of some standard features. It is otherwise largely unchanged from the 2016 model year. We note that about halfway through the 2017 model year, some safety, infotainment and driver assistance technologies were added to the Mazda6 and are often denoted as the "2017.5" model year for the car. The 2017 Mazda Mazda6 is a midsize, five-seat sedan available in three trim levels with several options bundles for each. The 2017 Mazda Mazda6 is "curvalicious," as one onlooker commented as we stood next to the parked car. 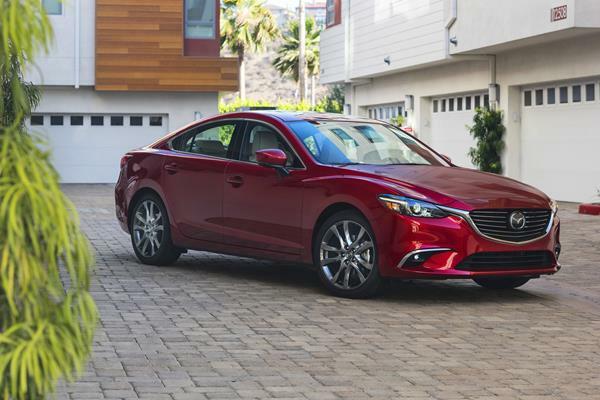 There is a kind of sexiness that comes from a very well-proportioned and executed design, and the Mazda6 definitely has that universal appeal every automaker hopes to achieve. The curve at the front fender arching over the front wheels, the light curve to the beltline accent straightening to contrast the lovely bend of the rear roofline as it approaches the hatch over the rear wheels, and the gentle arch of the otherwise unadorned hood all create a sophisticated and lovely look for the Mazda6. The car's silhouette features a classic flat bottom edge, curvaceous upper line and flowing middle accent that are unmistakably beautiful. Mazda's front grille on the 6 is the simple Mazda diamond centered by the winged flyer insignia and over-arched by a soft nose below the hood's edge. Slim headlamps emerge from the lower chrome accents of the grille's lower face, continuing their line into the fender. The appeal of the 2017 Mazda6 is its overall elegance and shapely sportiness. Putting a finger on any single detail detracts from the whole affect. The Mazda Mazda6 is easily one of, if not the, best-looking sedans on the road today, regardless of segment or class. Our only complaints about the 2017 Mazda6's interior are minute details. The modern, well-wrought design is centered on excellent materials and supportive seating. As a Ward's Best Interior, the 6 definitely does well for itself. Our chief complaints are with the location of the volume/mute knob for the radio, which seems to get bumped by the front passenger's elbow often, and the not-that-generous personal item storage in the car. We can live with the slightly smaller than average trunk space (14.8 cubic feet) because it's very usable and easy to access. The standard remote (physical) seatback release to drop the rear seats to expand the trunk space is also nice. The driver's seat and controls layout are well done and speak to this being a driver's car. We like the ease of access to regularly used controls, the well-placed and easy-to-read instrument cluster, and the adjustability of the driver's seat. The front passenger is similarly treated when it comes to comfort. Rear seating is very good, with the outboard positions having plenty of head and legroom for most passengers. The center spot is mostly for kids, but okay for adults during a short trip. The Mazda Connect infotainment system does very well in the Mazda6. The dial controller located below the shift knob at the driver's right hand is easy to use and gives good tactile feedback as it turns. The infotainment screen can also be used as a touchscreen if the vehicle is stationary - another nice idea. The 2017 Mazda 6 has a legible, high-resolution screen that's easy to read and complemented by intelligent, easy-to-navigate menus. A half-moon display of major elements starts things off and quickly becomes intuitive. A standard 7-inch screen is found in the 2017 Mazda Mazda6's base model. A driver's head-up display is optional on most trim levels and standard on the Grand Touring. Fuel economy in the 2017 Mazda6 is estimated at above-average levels for the segment and achievable in real life. The manual transmission models are EPA-rated at 24 mpg in the city and 34 mpg on the highway (28 mpg combined). The automatic transmission improves those numbers somewhat to 26/city, 35/highway and 29 combined. The GT Premium package ups that to 30 mpg combined, with slightly better city mileage thanks to its i-ELOOP regenerative braking system. 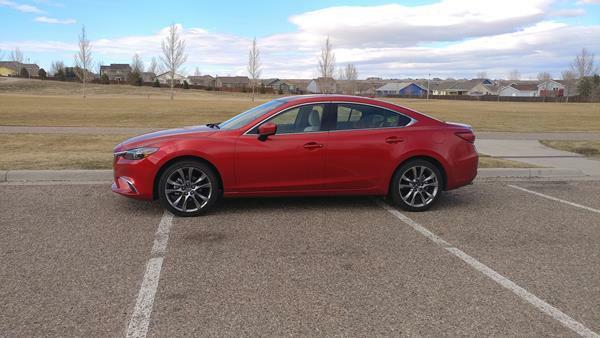 In the real world, we beat the EPA's estimates of 30 mpg combined in winter conditions at high altitude in our 2017.5 Mazda6 with the GT Premium package. Our average was just over 31 mpg for the week under mixed passenger loads and varied driving lengths and conditions. The 2017 Mazda Mazda6 is considered average in reliability. The J.D. Power and Associates Vehicle Dependability Study rates it as "About Average." Mazda's warranty is also about average for the segment. The 2017 Mazda6 has the best-available safety scores from both crash test organizations. The National Highway Traffic Safety Administration gives the 2017 6 an overall rating of 5-Stars, with five stars each for frontal and side crash tests, and four stars for rollover testing. The Insurance Institute for Highway Safety rates the 2017 Mazda6 as a Top Safety Pick Plus vehicle, with top scores of "Good" on all crash testing plus top scores for its available advanced safety equipment. 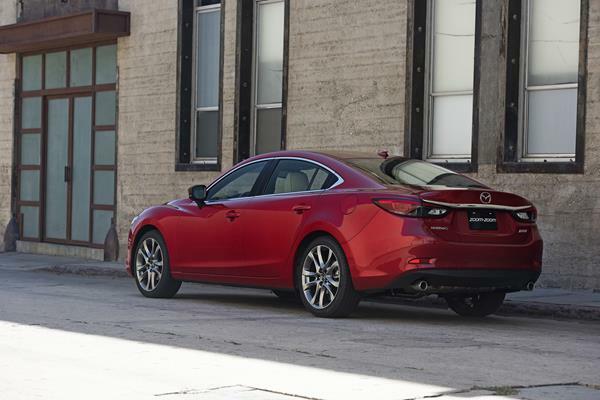 The 2017 Mazda6 doesn't have a larger or more robust engine option from its base. That puts off some buyers, but we think if you drive the 6 as-is, you'd realize that its standard engine is comparable, thanks to excellent drive dynamics, to any six-cylinder competitors might offer. The Mazda6's ride dynamics and handling are excellent. The quick shifting and fast pace the eight-speed automatic transmission gives really pushes the capabilities of that little four-cylinder. The four-cylinder engine in every 2017 Mazda Mazda6 is a 2.5-liter that produces 184 horsepower and 185 pound-feet of torque. A six-speed manual transmission is standard on the Sport and Touring models and can be upgraded to the eight-speed automatic transmission that's standard in the Grand Touring model. It might be against automotive journalist policies to cheer on an automatic transmission over a manual, but in this case, the Mazda6 greatly improves with the former choice. As a front-drive only car, the 2017 6 offers much better dynamics with the automatic (which includes paddle shifting) and is far better suited to that option. The auto trans boosts 0-60 mph times to 7.6 seconds for the 6, a full half second faster than the manual. On the road, the stiffness and responsiveness of Mazda's Skyactiv platform becomes readily apparent. The 2017 Mazda6 is both agile and fun, offering more confidence than any other midsize sedan we can name. Aiding this are great visibility for the driver, good acceleration from the engine and excellent around-town maneuverability. The Mazda6 is quiet on the highway, easy to maneuver around town and extremely well-considered in almost any driving situation. Even in inclement weather its good gravitational balance keeps it stable. We honestly can't say enough good things about the Mazda6's performance. The 2017 Mazda Mazda6 is nearing the end of its lifespan, as a new generation enters the field in 2018. That has resulted in flagging sales, meaning dealerships are happy to make deals to get their 2017 models off the lot before 2018 models arrive. Couple that with the 6's lower-than-average overall pricing structure and there is plenty of value to be had. The base model 2017 Mazda6 has one of the lowest prices in the class, while the top-end model can be had for under $30,000. 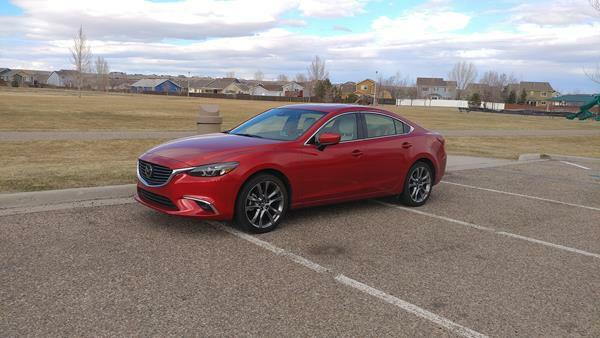 We recommend a well-equipped 2017 Mazda Mazda6 Touring model with the automatic transmission as the best price-vs-value option in the lineup. But any model and trim of the Mazda6 is a good deal regardless. The 2017 Mazda6 is one of the highest-rated cars we've reviewed. Yet it sits in the midsize sedan class of vehicles with many of our other highest-rated vehicles. Chief competitors to the Mazda6 are the best-selling Toyota Camry, the excellent Honda Accord and the equally beautiful Ford Fusion. Among these, the Mazda6 stands out for its combination of sportiness, well-rounded dynamics and overall beauty in design. The 2017 Mazda Mazda6 is one of the most overlooked cars in the automotive business, thanks to stiff competition in its market. However, it is one of the best options in the segment because of its overall excellence in almost every category. For those who want a penthouse-worthy vehicle at basement prices, the 2017 Mazda6 is it. This oft-overlooked sedan is a gem. Interested to see how the 2017 Mazda MAZDA6 ranks against similar cars in terms of key attributes? Here are the 2017 Mazda MAZDA6 rankings for MPG, horsepower, torque, leg room, head room, shoulder room, hip room and so forth.